23 books, 120 articles and 95 chapters he has held a number of key positions including Chair of the British Academy New Paradigms in Public Policy Programme (2010/2011). He is a Fellow of the British Academy and a Founding Academician at the Academy of Social Sciences. On the policy side, he participated in the Prime Minister’s No 10 ‘progressive consensus’ Round Table and advised the Prime Minister’s Strategy Unit between 2009 and 2010. Frances Ruane: Chair of the interdepartmental expert group responsible for the report) and Research Affiliate at the ESRI. Frances previously served as Director of the ESRI. Eithne Fitzgerald: Formerly Head of Policy and Research at the National Disability Authority, was one of three independent experts who contributed to the production of the report. The event was hosted by the Irish Social Policy Association and the Irish Disability Studies Association. Both Frances and Eithne made presentations, which can be accessed by clicking on their names, above, and there were questions and debate from the floor. The Irish Gerontological Society, in collaboration with the Irish Social Policy Association, was delighted to present an interdisciplinary symposium on reform in the provision of homecare in Ireland; specifically the development of an Irish statutory homecare scheme. Key experts discussed aspects of such a statutory homecare scheme from a number of perspectives including clinical, economic and policy. This multi-dimensional exploration of the future of homecare in Ireland will situated attendees firmly in the policy making process, offering a unique opportunity to make an informed input during the consultative process of the scheme. 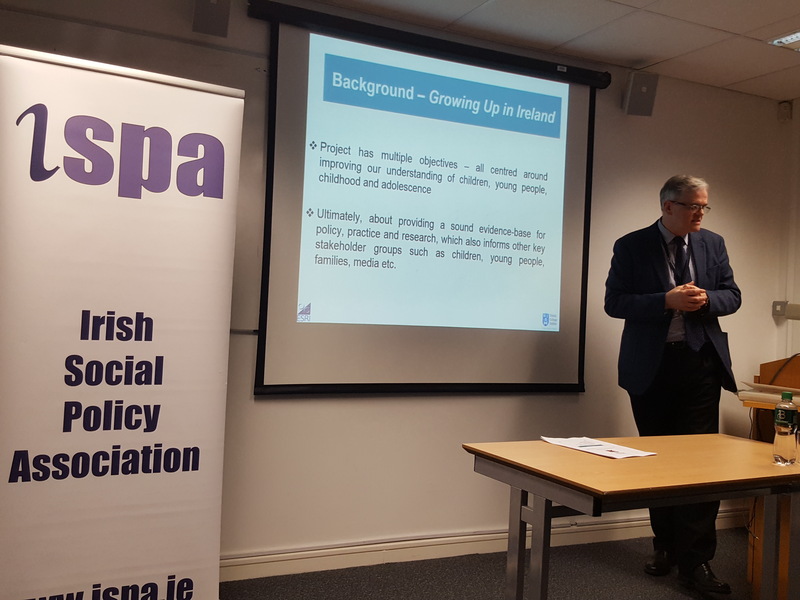 The seminar, which was hosted in association with the School of Social Policy, Social Work and Social Justice at UCD, consisted of a presentation from Peter Cassells with questions and discussion afterwards. Peter Cassells is Executive Director at the Edward M. Kennedy Institute for Conflict Intervention at Maynooth University. He also chaired the recent Expert Group on Future Funding for Higher Education. Monday, 5th December, 7:00 pm to 8:15 pm, Management House, DIT, Aungier St, D 2. The seminar consisted of a presentation from James Williams, followed by questions and debate. James Williams is a Research Professor at the Economic and Social Research Institute (ESRI) and is Principal Investigator and Co-director of the National Longitudinal Study of Children in Ireland (NLSCI). Full bio available here. The Growing Up in Ireland Study has followed the progress of almost 20,000 children across Ireland to collect a host of information to help improve our understanding of all aspects of children and their development. A recent report from researchers at the ESRI has used this data to provide the first comprehensive analysis of inequalities among children in modern Ireland. The report assembled findings from 10 years of the Growing Up in Ireland study to provide an authoritative description of how factors such as education, family and health in 21st Century Ireland influence children’s outcomes. The ground-breaking findings from the first longitudinal profile of children in Ireland provide insights into critical points in child development, allowing the authors of the book to investigate if the words in the 1916 Proclamation of Independence, resolving to “…cherish all of the children of the nation equally”, have been realised 100 years on from the Easter Rising. The book finds that despite many improvements in education, health and socio-emotional outcomes in the last century, children’s wellbeing in contemporary Ireland is largely shaped by parental circumstances and social position, resulting in persistent inequalities. The findings in the book point to implications for public policy that could support families most in need and help children to reach their potential regardless of family circumstances, health or ethnic background. The seminar will explore these issues and is being delivered by James Williams, Research Professor at the ESRI, one of the authors of the recent report and the Principle Investigator of the Growing Up in Ireland Study. Slides from the seminar are available here.